It was mid of the year and I know I’d spend the rest of the year busy, mostly to prepare a research paper as one of my college graduation requirement. Yep, I am still studying and now in my last semester, hopefully it would be my last. So, before I start turning into this focus-very serious person who would have extremely limited free time for myself, I decided to have a trip to Pahawang island in Lampung province, the southern part of Sumatera (one of the big islands in Indonesia). I learnt about Pahawang island from a colleague. She said I would be able to see nemo while snorkeling there. I browse the net to look for more info and found the place to be beautiful. So I decided to go there. I would love to spend this ‘last -me time-‘ hunting some nemo, even though I were wondering, would it be possible to find them without diving in deep sea? …and this is a brief journal of our trip. Enjoy! The photos upload is under progress. It will take longer time for me to publish this post with complete photos so I decided to publish it before. Just stay tuned for the photo update! Meeting point with other members in Slipi Jaya Mall. Slipi Jaya Mall/Dunkin Donut shop is the common meeting point for participants in Central Jakarta who join a trip to Pahawang island or other islands around Sunda Strait. Any bus headed to Merak, the port where we take ferry to Lampung, will pass this Mall. 7pm we took Milah bus to Merak port. It costs us Rp30k when taking this bus. The actual fare should be Rp25k, but we look like first timer that they charged us higher. Anyway, it was a 3 hours ride to Merak port. Meeting point in Merak would be Indomaret. Again, it’s another common meeting point for this tour participants. Indomaret is a mini mart in front of the port entrance, about 5min walk from Merak bus terminal. We took a ferry to Lampung (Bakauheni port). It departed around 11:30pm. Inside the ferry, I paid extra Rp10k to be in the executive room. The room looks like a lounge with nice sofa to sleep in. Probably a bit difficult to sleep in but with the help of Antimo, anti motion sickness pill, I could sleep that nite. We arrived in Bakauheni port around 3am. Headed to Ketapang port by car (APV). We stopped at a mosque for a morning prayer and then at a small local warung (like hawker) on the road for breakfast. We arrived at Ketapang port around 6-7am. It’s like a small port to take a boat to “Pahawang island”. The boat itself is very small. It’s a wooden boat with capacity up to 15 people, I guess. An hour later, we finally arrived in Pahawang island. I was amazed with the amazing view along the boat ride. We passed many small islands, plenty of greens everywhere, not to mention the clear greenish water… Wow!! After an hour rest and settling down our stuffs plus a short rest in a real bed, we started our snorkeling trip to “Gosongan island” and “Kelagian Kecil island”. Did I find nemo there? Yep, we found them. We were back to Pahawang island around 12pm for lunch. The main menu is fish, I guess. Ok, I kinda forgot the time when we had each menu, so sorry to all readers who joined this trip and found out that the meal order is not correct. Back to the lunch, it was accompanied with crackers and spicy sambal [chili paste]. The taste is not bad. 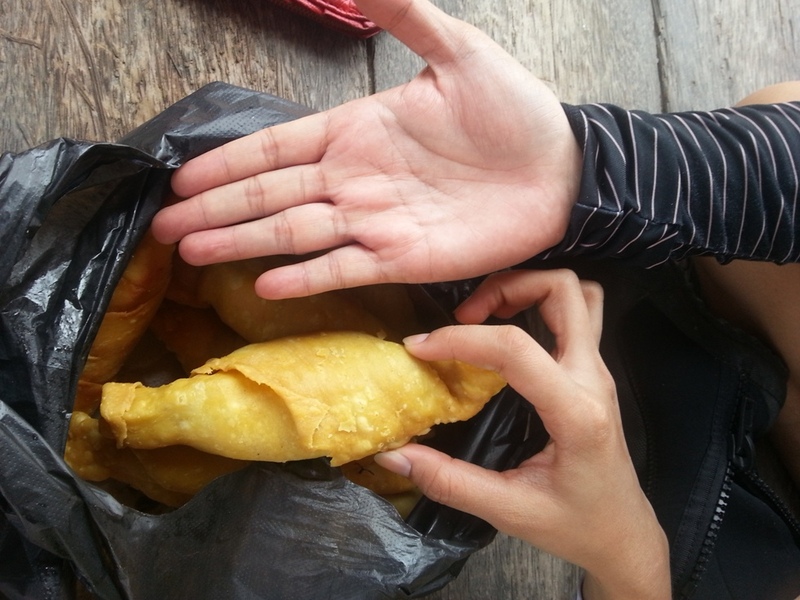 After lunch, my friends and I got a chance to talk with the locals and found out about the big yummy Pisang Molen [like hand size long banana fritters fried in thicker batter]. This became my (our) favorite snack during snorkeling break. 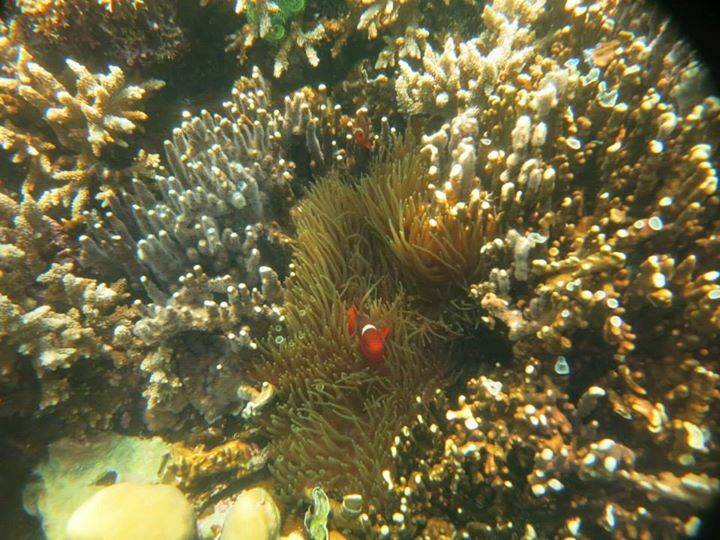 Continued the trip to snorkel in “Tegal island” and “Ma Item island” (again found nemo here). Enjoyed sunset in “Pahawang Kecil island”. Back to the main island around 6pm and straight to the bathroom. It was a long queue to take a bath since we shared one bathroom with other 10 people. Some took a bath in the public shower which is not recommended for the ladies 😀 Some took a bath together with their friends (same gender). Dinner: we had a local food with shrimp as our main menu, plus the usual side dish. It tasted not bad. There should have been a barbeque afterwads, but I skipped it to take a rest. It had been a long journey, straight joining this tour after work then had like 14hours on the road, plus 8 hours snorkeling trip. I did really need to sleep in a ‘real bed’. I should have watched the sunrise that morning but I’m not a morning person. Especially not after those long ride and those activities (or maybe I’m getting old?). So I chose to sleep a bit longer and used the time left for packing. 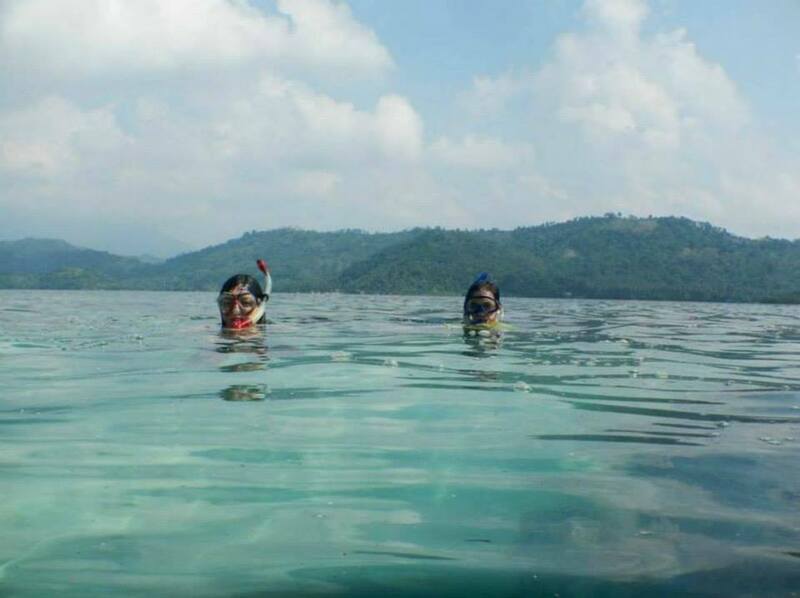 Around 8am, we started our last snorkeling trip to “Tanjung Putus island” and “Pahawang Kecil island”. That morning boat ride is the one thing I will never forget on this trip. The water was so calm that I didn’t even feel like I was in an open sea. The surrounding by green trees on the islands we passed. The fogs that form like a mist, covering the islands. It was so beautiful. Unbelievable! Amazingly beautiful! 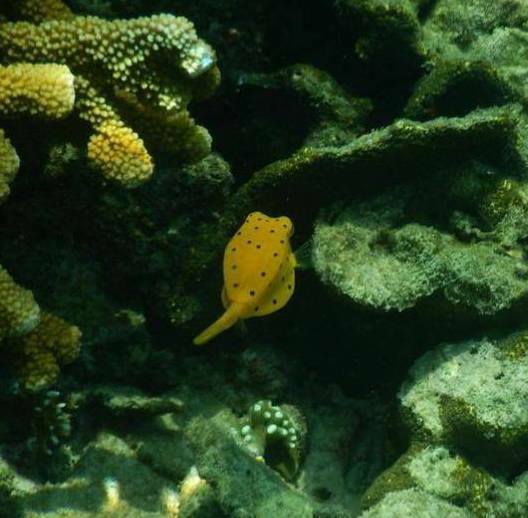 Then added with the next two snorkeling spots we visited, another perfect places to hunt nemo (many of them there). 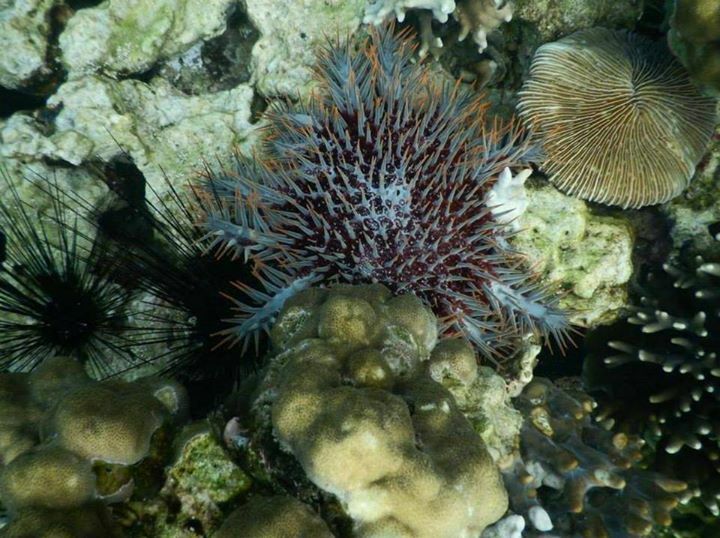 The corals and marine life are so fascinating ! OMG. LOVE IT!! 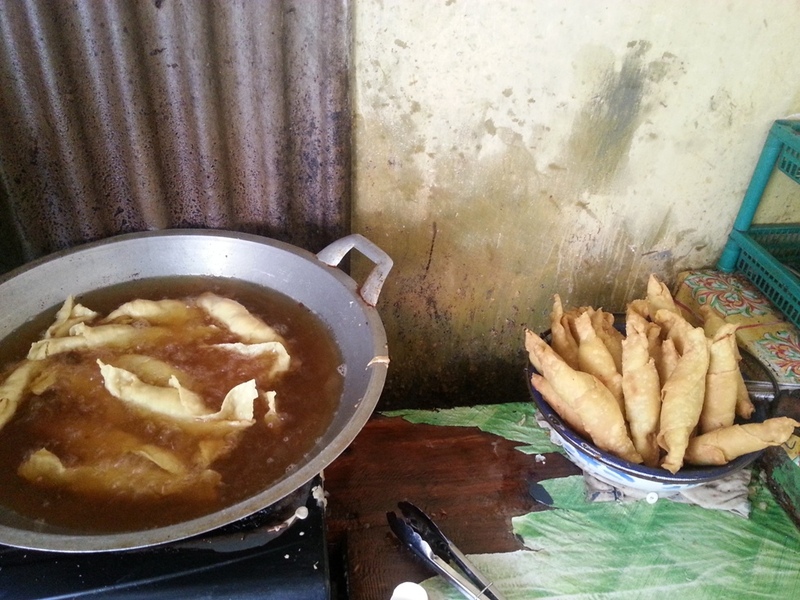 We were back to the main island around 11am, started packing the wet clothes and my snorkeling gears, then had a yummy fried Rebon [sort of fried small crabs cake] really crunchy. 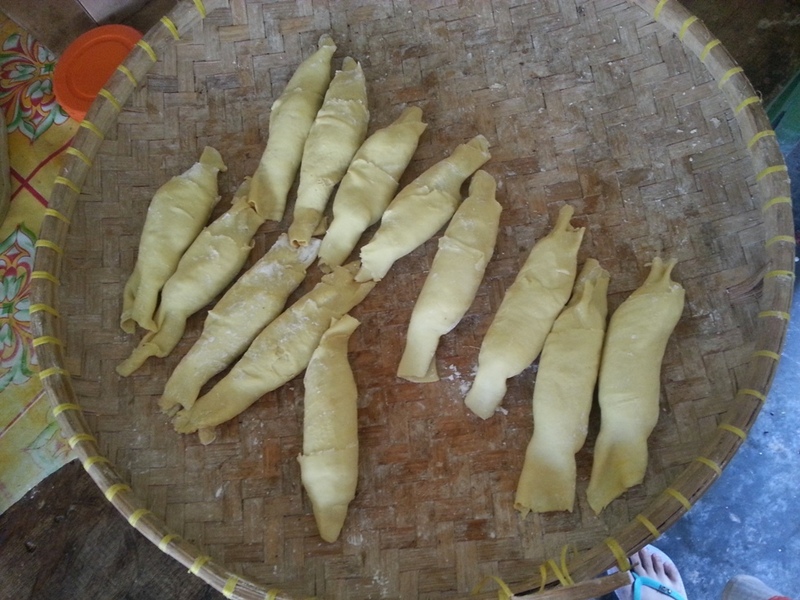 I like Rebon so I enjoy my last meal in Pahawang island :p Well, I enjoyed it all on my last day there. We left Pahawang island around 1pm, heading to Ketapang port by boat. There, a car had awaited to take us back to Bakauheni. On the way to to the port, we stopped at Yen Yen souvenir shop. It’s more like a snack store with their main snack: “banana crackers”. I just learned that day that Banana is quite famous in Lampung (:bummer: I supposed to know it as Indonesian, cause my friends know it). Durian as well, so we had some durian in front of “Yen Yen store”. Tasted yummy! Durian is always yummy :p Then we continued the ride. Geez, the driver drove so fast like in a race or something. Scary!! We finally arrived at Bakauheni port and took the 6pm ferry to Merak port. Again we upgraded our ticket for an executive room. This time the room is not as good as previous one. No sofa, only some big comfy seats in a row. Hpf… I slept along the way (tried to). We arrived Merak around 9pm and then from Merak bus terminal, we took Primajasa bus to Jakarta/Kampung Rambutan terminal. It was a very long journey, 12 hours in total from Pahawang island to my home in East Jakarta. BUT it was a wonderful journey. I can’t wait to go back to this island, and next time, it should be more that 2D/1N trip. Merak bus terminal is not that big. It’s connected with the port, about 10m walk. Along the way, there are many snack stores, souvenir shops, hawkers and a minimart/Indomaret. Merak port itself is quite big. I walk about 10min from the entrance gate to the ferry. They use electronic ticket that might be tricky in the entrance gate. The machine might reject the card as experienced by my friend. Just make sure you keep the receipt if you don’t want to buy another one. It takes about 2-3 hours ride to reach this port. It is a small port, more like small boats dock. You will see some wooden passenger boats here. One of those boats will take you to Pahawang island or other nearby island, I guess. I learnt that this is a famous souvenir shop in the city. It’s about an hour ride from Ketapang port. The most wellknown snack is their banana crackers. 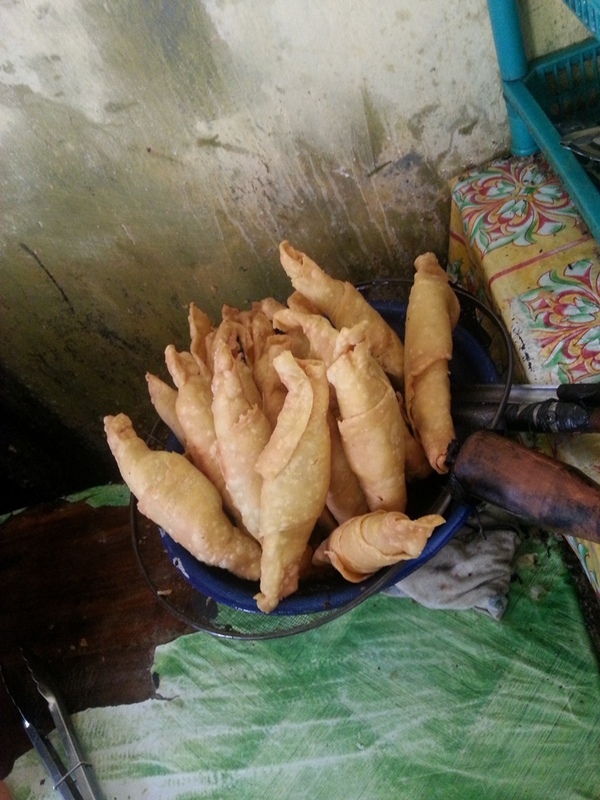 It has vary flavors, chocolate, cheese, sweet, etc. My fave would be coffee flavor. Price is very affordable. Adding my description above, the homestay I got has 2 bedrooms. These rooms are occupied by the girls. I shared it with 4 girl friends. Meanwhile the boys slept in the living room and common room using a bed put on the floor. There are limited electric sockets so make sure you bring some cable extension. The electricity is 12 hours only. The downside would be the bathroom which only one there and very minim lights at nite. The island is big but not much people living there. Houses are mostly found near the port. I tried to explore it at nite, but most of the areas are still woods that I don’t wanna walk that farther. There is no white sandy beach as the pictures I found in internet. However, the people are nice and kind. It’s like living in a small village, away from the hectic city, which I really need. Although I found out that it is an epidemic area for Malaria, I won’t hesitate to visit it again. Well, the locals informed the tour organizer that it’s just a rumour. But hey, I won’t take any chances so I (and my friends) took some preventive actions. Me, I took Resochin as preventive medicine, and drink it a week before trip, on the day of my arrival in the island, and the next four weeks after the trip, which all should be drink in the same day. Lets say you’ll be in Pahawang island on Thusrday, so I took it on Thursday a week before, on Thurdays of the arrival day, and on each Thursday for the next 4 weeks after the trip. I even still drink it till today. There are other medicines that you don’t have to take as long as mine. Unfortunately, I didn’t have enough time to look for it. It is a better snorkeling site than Gosongan island. The water is calm, many floral corals there. Too bad the corals look dead/white color. But we found nemos here ^^ It’s so like hunting the nemos. Amazing! The water is great to learn how to snorkel. It’s calm and deep enough. But the visibility is so low. Hard to see above 3m. 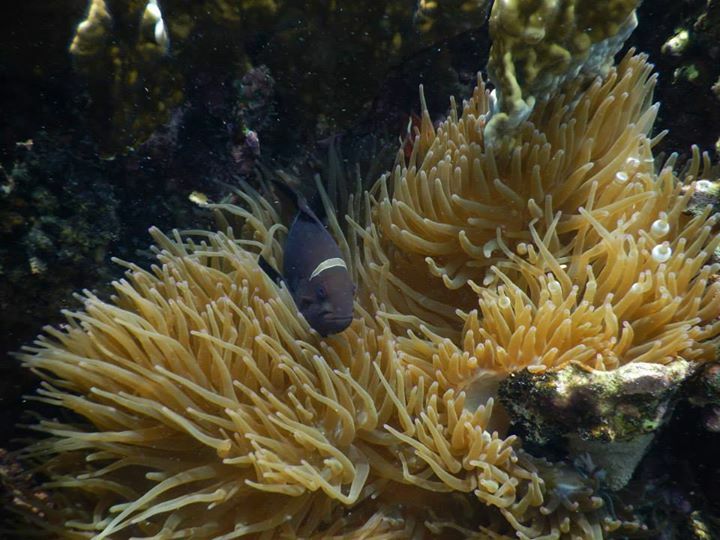 My friend said she found nemo there but I couldn’t find it. Anyway, I am not comfortable when I can’t see what’s beneath or around me that i was just swimming around for like 15min. This island has this long white sandy beach that looks like a path in the middle of the ocean. When facing the island, the water on my left would be the place to drop the participants. And on the right, it is a shallow water (50cm deep) full with small rocks and fish. If you are good at swimming/floating, try to swim about 15m from the beach and you will find 2 big nemos, in red and black, near the place which looks like a sinking boat. The water is not clear that I can’t recognize it. But I know nemo once I see it. Unfortunately, my camera ran out of battery. If not, it would be so easy to take their picture. They are so close!! We visited this island twice. First was for sunset. It was so lovely walking in the white sandy beach which is also like a path but the cool thing about this one is that it goes til the other island, like connecting two islands. Wow!! The view is amazing! The next visit is for snorkeling. This island seems to have been a commercial one. I can see beachfront café and hotel on the beach. And the underwater… OMG! It’s like 2-3m deep with big corals and colorful one. I can see bat fish, angel fish, and again the nemo. The water is very clear as well. WOW!! I can spend hours just swimming around the site. I would love to go back there. Be carefull when you drop off from boat. You might hit the rocks because it looks deep but it is not that deep. This site is as beautiful as Pahawang Kecil. It’s deeper though but wider. 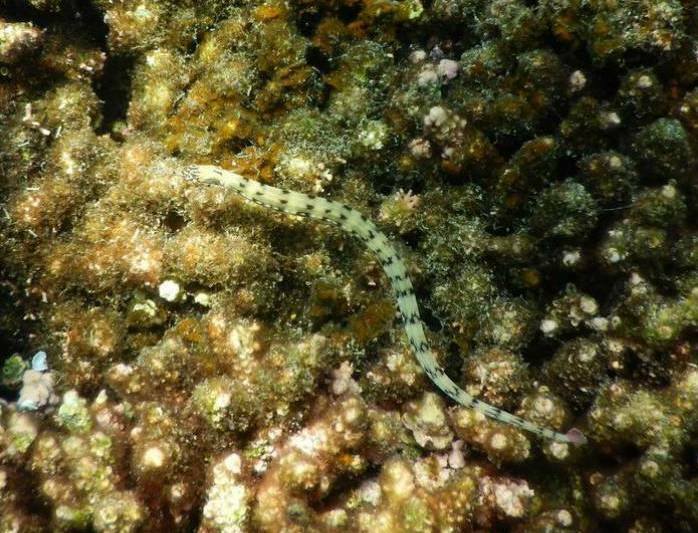 You can find many schools of small coral fish. Snorkeling trips, include floating jacket. Other gears (mask, snorkel, fin) should be rented. It’s Rp50k/day. This tour organizer is “Gila Nusantara”, a group of young backpackers I found in the traveler forum “Backpackers Indonesia”. My opinion about them would gonna be not so good. They lacked of organizer skills, not intuitive, not sharing information in detail. I don’t even know that the electricity there is only for 12 hours. I just found out that Pahawang island is one of epidemic areas for Malaria. They didn’t inform us the agenda of the day etc. This is the second time I joined a group of backpackers travelling together, and if they are just backpackers sharing trip cost, I have no problem with it. But if they called themselves a tour organizer, then they do need a lot of improvement on how to organize a trip. So honestly, I won’t join them for other trips. Mineral water = around Rp5-7k/1 liter bottle at the port and in the island. All the images here are copyright of the author and their respective owners.